Fluids involve gases and liquids behavior during different pressure- and temperature states. 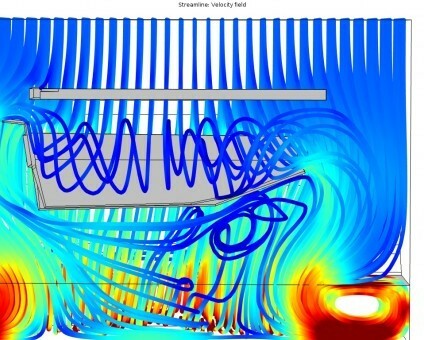 With CFD, complex flow- and thermal problems, stationary as transient, can be solved. Substantially, one can study the efficiency of a fan, the pressure drop in a pipe system or the thermal distribution for a component or a system. Often, CFD is used as a tool to provide accurate thermal- or pressure boundary conditions to a FE-simulation for e.g. a fatigue prediction. We have experience from CFD-simulations within production, powertrain, telecommunication and heavy vehicles.